ECU offers innovative and practical courses across a variety of disciplines and we have a vibrant research culture. 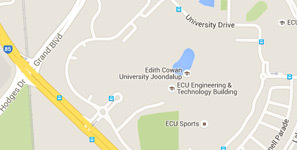 ECU is a leader in developing alternative entry pathways to higher education. We have three campuses in Western Australia. Joondalup and Mount Lawley in the Perth metropolitan area and our South West campus in Bunbury, 200km south of the Perth CBD. ECU provides a variety of services and facilities that go beyond the classroom, with opportunities for personal development and social interaction for students and staff. At ECU we concentrate our research in areas of strength to deliver tangible outcomes. There are several ways to get involved with research at ECU. ECU has a lively research community that is committed to supporting research students. Our Office of Research and Innovation provides comprehensive support services to researchers. Universities like ECU must constantly refine their courses to stay ahead of industry trends. Disruptive technology, a changing climate and new industry trends means the world of work is constantly evolving. And that means universities must continue to adapt, developing new courses to allow graduates to take advantage of these changes. Here's four new ECU courses that have been launched in the past decade. Australia’s climate and outdoor lifestyle has made us a nation of sport lovers. If you’re more than a casual observer of what happens on a football field, then this course might be for you. The Bachelor of Science (Sports Science and Football) is the only one of its kind in Australia and offers you the skills to coach players in all areas of football, especially Australian Rules Football. Fast-paced and a great spectator sport, the game is increasingly offering professional career opportunities in coaching, analysis, administration and teaching. And with the AFL looking to see the sport promoted overseas, there are likely to be job opportunities beyond Australia. Online gaming has come a long way in a relatively short period of time and is now one of the largest growth industries in the world. Australia’s gaming industry generates nearly $3 billion in revenue, a figure that is growing each year. Just look at the hype surround the release of major new games, which now attract more interest than many blockbuster Hollywood movies. The Games and Interactivity Major looks at traditional multi-media and emerging interactive technologies, so that individuals can design, script and develop digital media products. Skills and knowledge in renewable energy is expected to be in demand in the future. Australia has the perfect climate to embrace solar and wind power. Engineers that specialise in fields that exploit this cleaner, greener electricity are likely to be in demand. This degree looks at the generation of electrical power using renewable sources, including wind and solar and also hydro, biomass and geothermal. Graduates who complete the Bachelor of Engineering (Electrical and Renewable Energy) course will have specialist skills to design, develop and manage electrical and renewable power generation systems. Those with paramedical experience may be interested in Aeromedical Evacuation. If you already work in emergency services and are seeking a new challenge, you might be interested in the Master of Disaster and Emergency Response course which provides a broad understanding of what it takes to provide support and leadership at the scene of a major incident or disaster. The ongoing effects of climate change, conflict and population growth around the world means skilled practitioners in this field are likely to be in demand from emergency response agencies and non-governmental organisations in Australia and internationally. Are you a healthcare professional interested in providing supervised exercise training for people with cancer? The Master of Exercise Medicine (Oncology) course will give you the skills to deliver targeted exercise programs that can dramatically improve the lives of the vast majority of people with cancer. And with an estimated 134,000 Australians diagnosed with cancer each year, there is strong demand for more skilled healthcare professionals to provide exercise assessment and prescription to this growing patient population. Want to study with us? If you’re interested in studying any of these, or the more than 300 other courses, at ECU, check out our Future Students webpages. Here you’ll find information about this and related courses, including videos and galleries about our facilities, our students and our lecturers. Please leave a comment about your rating so we can better understand how we might improve the page.